I manage the German office in Düsseldorf. From taking enquiries through to project design, management, analysis and presentation delivery I am responsible for serving our clients in German speaking countries, ensuring their research requirements are met. 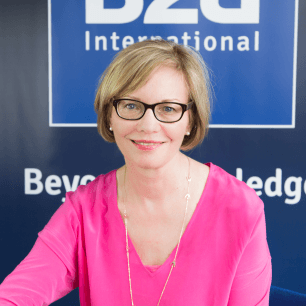 It’s all about diversity: I like the diversity of the great team here at B2B International. At the same time I like the diversity of our clients, who can vary from small to large companies, from manufacturers to service providers, from Europe to Asia. I also like the diversity of projects. I love to delve deeply into each project and try to capture what the question is about and how we can find the best solution for the client and finally help them to grow. I’m struggling to decide, whether it’s sitting on a bench on the hilltop behind my family’s house overlooking the vineyards and the river Mosel (while enjoying a glass of fresh Riesling wine of course) or whether it’s sitting in a Greek tavern directly on the sandy beach somewhere on an Aegean Island watching the sunset. There are so many and it’s hard for me to pick only one! To start with: among my favourite authors are Mario Vargas Llosa (The Green House) and Gabriel Garcia Marquez (One Hundred Years of Solitude). And I love ‘Tales of Protection’ by Eric Fosnes Hansen. I also would add Thomas Mann to the list (The Magic Mountain, Buddenbrooks). I love classical music, above all others I love the Opera. I spend quite some time to visit new productions, symphonies and chamber music concerts. I am also an insatiate reader of novels (see above). As an equation for these indoor activities I enjoy being outside going for walks or going running, mainly when the weather is pleasant. To unwind I like to do Qi Gong.